GRAND TRINE hail from Montreal, Canada. Their 7″ on Almost Ready Records comes with two songs which were originally included on a single by The Bohemians from way back in 1967. One of Grand Trine’s members, Tobias Rochman, had a dad in a 60s garage rock band called The Bohemians and together Grand Trine have recreated the same Bohemians 7″ from 1967. “Say It” is quite a dirge if there ever was one. Yearning lyrics combine with the longing vibe of this hazy psych dirge with a moody, deep-cutting lust that truly gets the point across of this slowly oozing psych jam. On the A-side, “I Need You Baby” turns out to be the total opposite with it’s suddenly upbeat pop vibe and electronic drum beats. 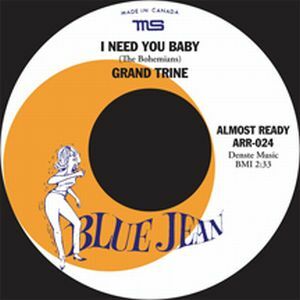 Unfortunately I haven’t been able to hear the original versions of these songs from the 1967 single, but chances are Grand Trine have done these songs plenty of justice. In the end, after at least three years it must be nice to know this single finally sees the light of day. Hear both sides of it right below. BUY the 7″ directly from Insound – limited to 300 ! Posted on July 3, 2012 December 3, 2012 by styrofoamdronePosted in 7", ReviewsTagged garage rock, Lo-Fi, psychedelic.